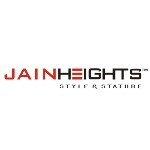 Over the years, we at Jain Heights have pioneered in nurturing the concept of Style and Stature in living standards and adding immense value to our business credibility. Our vision and endeavour has always been to create orld-class spaces and provide a high quality of life for people who personify themselves with a sense of luxury, convenience and an enduring relationship. Jain heights will be recognized as a leader in the Indian real estate development industry for our world class residential, work and retail spaces.We will successfully integrate the industry's best practices with our progressive programs and visionary management to create world class developments. Through our prime locations, design excellence, space planning, quality of construction and luxury amenities, we will be the first choice of discerning buyers and investors for residential, work and retail spaces that eptomize style and stature.